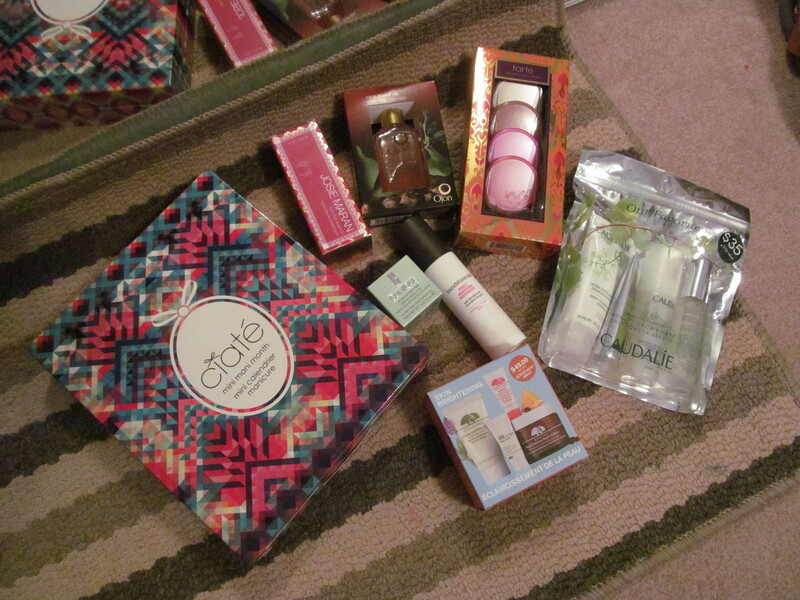 I have a haul post today. Yesterday was the beginning of the Sephora Friends & Family sale and for those who live in Canada you needed to print out the e-mail and take it into the store in order to get a discount. Click Here to get to the page to print out the coupon. Now the only catch is that you have to be a VIB member in order to get the discount but the positive thing is that you can also extend your discount to a friend (hi mom!). I went a bit overboard this time around but I have been saving up for this sale so this is just me justifing the amount that I spent. So the products are as follows: Ciate’s Mini Mani Month ($64CDN), Josie Maran Argan Oil ($58CDN), Clinique All About Eyes Rich ($37CDN), Tarte Fantastic Foursome Blush Set ($46CDN), Ojon Rare Blend Total Hair Therapy Oil ($42CDN), Caudalie Our Favourites Kit ($35CDN), Origins Skin Brightening Superstars Kit ($49CDN), Bare Minerals Purely Moisturizer ($35CDN), and not pictured is a Tarina Tarantino Eye Dream Hyperliner in Tommy Jet ($11CDN). Grand total of $316.68 with tax (if I lived in a different province I would pay more due to taxes thankfully I live in Alberta). Yes, this was a lot just for myself but I use this time to stock up on my skincare items (are you surprised there wasn’t anymore makeup products? I was surprised too!) and try new skincare since skincare is pretty pricey to begin with. I am going back to Sephora again this Saturday with my mom to get her stuff (and for me hopefully not spend too much again). If you guys picked anything up from the Sephora Friends & Family Sale let me know in the comments below. Happy hauling!